This model featured a wheelbarrow design. 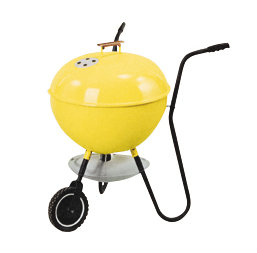 The target consumers for the Ranger were people who wanted a full-sized 22" Weber kettle that could be wheeled anyplace. People could take it to beach parties, remote picnics, tailgating parties outside sports stadiums or deep into the woods where hunting enthusiasts set up camp. This model was not our best example of Weber engineering. The original models lacked fasteners to hold the barbecue kettle to the frame. If the handles were lifted too high the kettle could slide off the frame. Our engineers thought that consumers would simply know the tipping point where the kettle would slide off the frame. That was a bad assumption on their part.